You can finish an embroidery project in many different ways, but one of the simplest (and perhaps the most classic) ways is to frame your work in an embroidery hoop. And although you could use a hoop right off the rack, why not give it a bit of flair by painting the hoop first? This easy enhancement makes your project look more finished. Plus the ring of color around your embroidery creates a frame that helps draw the eye to your work. Another benefit of painting embroidery hoops is that it improves the look of an inexpensive hoop and makes it look a lot nicer. You don't notice the flaws in the wood as much after covering them in a bold color! 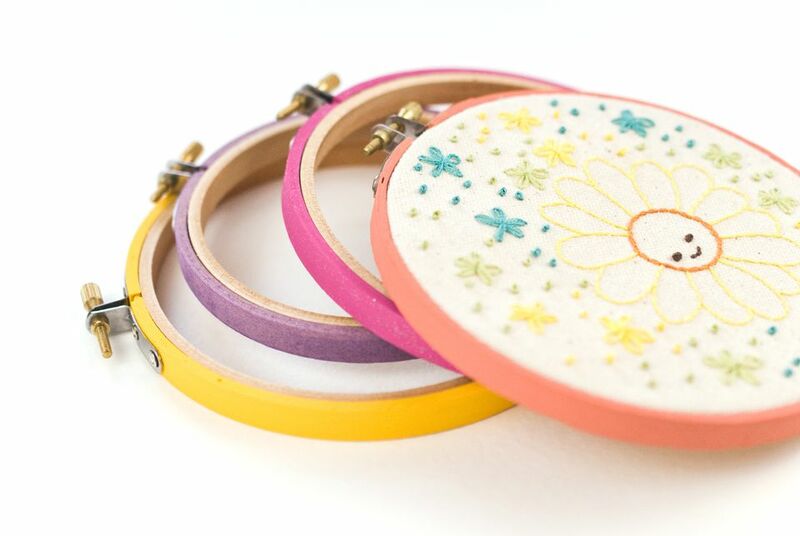 Once you try painting a hoop, consider even more ways to embellish your embroidery hoops! While they come in many shapes, sizes and materials, choose a hoop that will frame your work well. It's usually easier to work in a larger hoop and then frame the finished embroidery in a smaller hoop that will be closer to the design. Wood or bamboo hoops are best for painting. This type of craft paint is available with different options and a variety of finishes. And really, any will work. Most have a matte finish, but you can also find some with glossy, metallic or glitter finishes. You don't have to spend a lot of money on a paintbrush, but it's good to have one that has soft bristles. Also, it's helpful to have a brush that has a tip that's fine enough to get around small areas on the hoop. This is optional, but it's a great work surface. You can squirt a bit of paint onto the plate, rest your brush on the edge and let the hoop dry, all without worry of getting permanent paint where it shouldn't be. The first thing you need to do is check that your hoop is ready for painting. If there are any tags or stickers, remove them. If a sticker leaves any residue, remove all paper and as much adhesive as possible. Some hoops, such as bamboo, have a protective layer over the metal hardware. You can leave this in place for now, as it will prevent that area from being painted. Remove the inner hoop before you start painting. Paint the sides of the hoop and the thin front edge. It's not necessary to paint the back edge, but it does make the hoop look nice, especially when gifting it. Depending on the quality of the paint, as well as the color, give the hoop 2 to 4 coats of paint. Let the paint dry completely between coats. Typically it only takes a few minutes to dry. As you paint around the metal hardware, take care to paint only on the wood. However, you need to work the brush right up next to the metal to cover the entire hoop. With some colors, it's not as noticeable if you miss a spot. However, darker colors show more natural wood through the paint. Unscrew the top of the hoop enough so that you can separate the ends of the wood and paint between the hardware. Hold it open while you paint and for a few minutes while it dries. If you do happen to get some paint on metal, let it dry. Then scrape it away with a toothpick. The most basic way to finish a hoop with paint is to use a solid color. It's fast and easy, and you can coordinate the color with your embroidery. The yellow hoop uses this technique. To give your hoop a color stain or watercolor look, mix a tiny bit of water in with the acrylic paint. Using brown paint will give the hoop a stained wood look. The purple hoop uses this technique. Give your hoop some bling with glitter paint. Start with a base of color and paint the glitter on after. Add layers until it has as much sparkle as you want. The pink hoop uses this technique. When you are all finished, you can add a top coat of sealer that will both protect the hoop and give it some shine. Be sure that everything is completely dry before hooping your embroidery and preparing it for hanging.